Congress in 1997 had given outside support to Prime Minister IK Gujral but the fragile government was in a constant threat of losing the numbers in the Lok Sabha. IK Gujral had become the Prime Minister of the United Front-led government after HD Devegowda had to resign due to lack of support for his government. However, IK Gujral too, walked on a thin line facing the imminent threat of his alliance partners pulling out their support. From taking action against the then Bihar Chief Minister Lalu Prasad Yadav, who was an alliance partner, in connection with a corruption case in the Fodder scam to his recommendation of President’s rule in Uttar Pradesh in 1997, his government was treading on a tumultuous path. The final nail in the coffin was the demand of Congress to take action against another alliance partner of the United Front government – the Karunanidhi led DMK. The Congress’s demand had gained momentum after the report of the Jain Commission which probed the assassination of former Prime Minister Rajiv Gandhi indicted the DMK of cozying up to Sri Lankan guerrilla group – Liberation Tigers of Tamil Ealam (LTTE) – whose cadres killed Rajiv Gandhi. In more than two weeks since the 5,280-page report had come out, Congress had not let even a single session of Parliament function seeking action against DMK. Despite repeated threats by the Congress of withdrawal of support, the 13-party United Front coalition refused to bow down to their demands of ousting the DMK, and its three representatives in IK Gujral’s cabinet. And, for the second time in the 11th Lok Sabha, Sitaram Kesari-led Congress brought down the United Front government. Elections were scheduled to be held over a period of three weeks in February and March. The triangular fight was between the Bharatiya Janata Party which was the largest party in the 1996 election, United Front which had been in power over the last two years and Congress (I) which was opposing the two groups. The fate of coalition governments over the past terms had shown that stability was much needed for the country’s progress. Parties vigorously campaigned to convince the voters on how they would bring political stability and handle the economy of the country. The other issues which were often spoken about during the campaigning ranged from employment generation to tackling corruption, providing safe drinking water, electricity, sanitation among others. With an aim to improve its 1996 tally, the Bharatiya Janata Party reached out to the voters with an agenda of economic nationalism and promising to protect the domestic industry from international competition. Reiterating its stand against foreign direct investment, the party promised to restrict direct investment to non-priority areas if it comes to power. The Congress, on the other hand, advocated in favour of foreign investment focussing on how it can reform the country. The Congress seemed to be getting a tough fight from the Bharatiya Janata Party forcing the grand old party to think of desperate measures to save itself from another defeat. The trump card then that the Congress was looking for was Sonia Gandhi, former prime minister Rajiv Gandhi’s widow who till then had refused to enter the political fray. Succumbing to the requests of party leaders to save the party, Sonia Gandhi stepped into the ring. Yet again, when the results were announced, the election threw up a hung Parliament. The Bharatiya Janata Party emerged as the largest party with 182 seats. The BJP bagged the maximum share of votes in the Hindi belt. In Uttar Pradesh, where the party’s movement to build a Ram temple in Ayodhya had gained pace, it secured 57 of 85 seats. It bagged 30 seats in Madhya Pradesh, 20 in Bihar, 19 in Gujarat and 13 in Karnataka. However, in Haryana it one just bagged one seat as compared to the 1996 election result when it won 4 seats. While in Rajasthan, it bagged 5 seats as against 12 in the previous election. It lost its ground in Maharashtra too – having won just 4 seats as opposed to the 1996 tally of 18. It gained marginally in Delhi, with wins in 6 seats, one more than the previous tally. As for the Congress, Sonia Gandhi’s entry into politics had helped the party but failed to generate another sympathy wave in favour of her – like was the case when Rajiv Gandhi won in 1984 after Indira Gandhi’s assassination. Even in the South where Congress for several years had a stronghold, the party failed to make a mark. The party significantly improved its numbers in Maharashtra where it bagged 33 seats as against 15 in the last election. 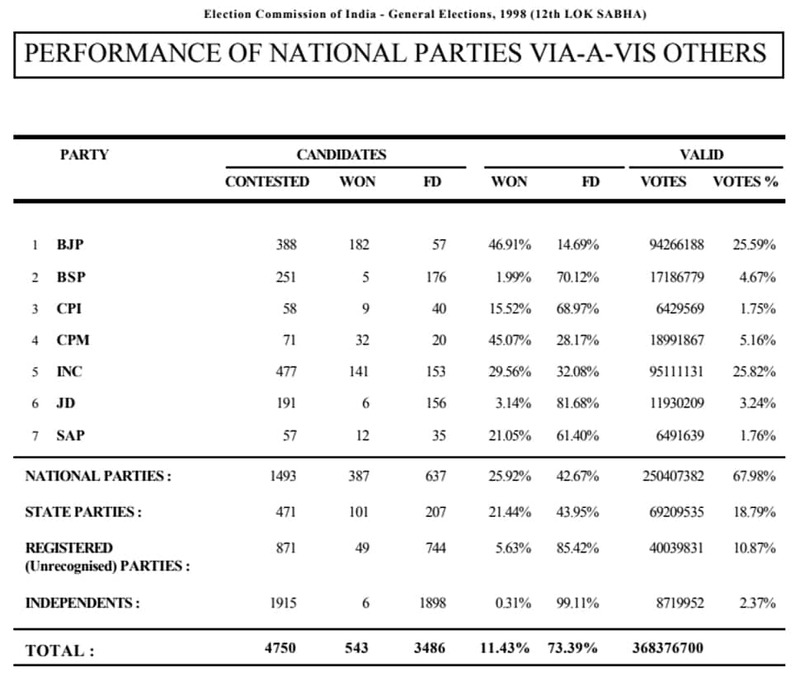 However, just like the 1996 election, it failed to win even a single seat in Tamil Nadu. Though it marginally improved its tally in Kerala, Karnataka and Madhya Pradesh where it bagged 8 and 9 and 10 seats respectively. It maintained its 1996 tally in Andhra Pradesh with wins in 22 seats. Among the Communist parties, the Communist Party of India (Marxist) maintained its tally of 32 as was in the last election but the Communist Party of India lost some of its seats and settled for wins in 9 constituencies. The Janata Dal managed to secure just 6 wins in the 1998 election, winning three seats in Karnataka and one each in Andhra Pradesh, Bihar and Punjab. In the 11th Lok Sabha, Bahujan Samaj Party had started to make its presence felt by winning 11 seats. However, in the 1998 election, the party won just five seats – 1 in Haryana and 4 in Uttar Pradesh. The United Front – which was the coalition of regional, leftist and low-caste parties – along with its other allies bagged 97 seats. Altogether 4,750 candidates, including 1493 from national parties and 471 from state parties took part in the election. There were 1915 Independent candidates too who were in the fray of which just 6 emerges as winners while the deposits of 1898 candidates were forfeited. After the results, the Bharatiya Janata Party staked claim to form the government and with the support of allies, mustered up 286 seats in the House and Atal Bihari Vajpayee took oath as the Prime Minister. However, the number 13 seemed like a bad omen for Atal Bihari Vajpayee. While his government in 1996 had lasted for just 13 days, this time the clock was ticking against the government in just 13 months. For several months, alliance partner All India Anna Dravida Munnetra Kazhagam (AIADMK) had been threatening to withdraw support from the ruling coalition if all criminal cases filed against her by the Tamil Nadu government were not removed. Just when the Bharatiya Janata Party-led government was indulging in the one year celebrations, they were caught off guard by the AIADMK MPs who withdrew their support. The Central government was asked to prove its majority in the House and in a historic turn of events, which kept everyone on the edge, the government lost by just one vote – securing 269 votes to 270. Mayawati leading the 5 Bahujan Samaj Party MPs in the House had promised its support to the Bharatiya Janata Party but when she rose to speak in the House, she said that she was against the government, tilting the balance in favour of the opposition. Blaming Congress for its ‘sinister’ moves in bringing his government down, Atal Bihari Vajpayee in an uncharacteristically aggressive speech vowed to come back to power and exuded confidence that 800 million Indians would make up for the one less vote that he got in the House.